1) Fish oils. There are numerous theories as to what actually causes fibromyalgia, but it is generally recognized that the poorly understood condition often results in what appears to be systemic inflammation for many of the people that suffer from it. Because of this, it is important that fibromyalgia sufferers stick primarily to an anti-inflammatory diet that includes plenty of fish oils. Since one of the marked characteristics of fibromyalgia is intense muscle and joint pain, supplementing with high-grade salmon oil, skate liver oil, or a fermented cod liver and butter oil blend, for instance, can provide amazing relief for fibromyalgia sufferers, as these oils help lubricate the muscular system and fortify the body with necessary omega-3 fatty acids, which feed the brain and quell inflammation. 2) Turmeric. Another powerful anti-inflammatory food with amazing pain-relieving properties is turmeric, an ancient spice commonly used in Indian and Asian cuisine. 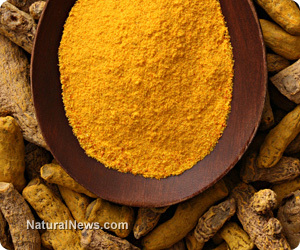 As it turns out, turmeric works better than many pain killer drugs at relieving joint pain, stiffness, arthritis, muscle spasms, and many other debilitating pain symptoms commonly associated with fibromyalgia. 3) Fermented foods and beverages. Irritable bowel syndrome (IBS) and various other forms of gastrointestinal upset often go hand in hand with fibromyalgia, which is why it is vitally important for individuals with the disease to actively work towards restoring floral balance in the gut. One of the best ways to do this is to consume plenty of fermented foods like raw sauerkraut and kombucha tea, both of which have helped many fibromyalgia sufferers to avoid the headaches, brain fog, and systemic pain they would otherwise face. 4) Juiced marijuana leaf. From a neurological perspective, fibromyalgia can also come about as a result of neurotransmitters throughout the central nervous system failing to properly communicate, which in turn can lead to the over-sensation of pain throughout the body that is characteristic of fibromyalgia. This is where juiced marijuana leaf comes in. Rich in neural-repairing cannabinoids, juiced marijuana leaf can help complete the positive feedback loop in the brain that, when obstructed or damaged, causes chronic inflammation, autoimmune disorders, and various other problems often associated with fibromyalgia. 5) Avoid wheat gluten. Eliminating wheat and other gluten-containing foods from the diet has helped many people with fibromyalgia all but eliminate their condition and its corresponding symptoms. Most modern wheat varieties contain high levels of complex gluten compounds that greatly upset the digestive tract, which is where many inflammatory and neurological conditions like fibromyalgia are thought to begin.